There are two bedrooms both airconditioned with three single beds and a queen bed available, backyard space for children, off street parking on driveway for 2 cars plus street parking available. There is not a better value property available in the area. Our neighbourhood is a mix of small business, eateries and residential. We are also very close to the medical precincts and Alexandra Park where you can take a relaxing stroll along the river walks and visit Bundabergs' very interesting little zoo. The central business district and shopping centre are within walking distance or a short drive away. There is a regular bus service which stops outside the Oscar Motel and we are close to the Bundaberg Railway Station. With a fantastic aspect maximising breezes the Interior of the house is upstairs with balconies on the front and back of the house, fans in all rooms with new tap wear. Furnished with quality lounge and dining suites along with a Panasonic 50inch TV with google Chromecast connected to allow Netflix, YouTube and more to be streamed from your own device via NBN. This property is continually being upgraded and well maintained. Guests will have full access to inside and outside the house, excluding the storage area underneath the house. Guests also have access to the Pool of the Oscar Motel with easy access through the back yard gate. We will be available if there are any issues or concerns that arise, but otherwise we are quite happy to have a hands-off approach to allow guests to enjoy their holiday as they please. Guests to Oscar House have full use of guest laundry and the swimming pool and gardens of Oscar Motel. WIFI NBN is connected and has great signal throughout the entire property. Pets are welcome, however not inside the house please. The property is managed by motel managers and is professionally cleaned by motel cleaners. With prior arrangement we have onsite storage for boats or caravans. toilet, combination tub/shower, Bathroom includes shower, Vanity and Laundry wash basin. Bathroom includes shower, vanity and wash basin. With prior arrangement we have onsite storage for boats or caravans. WIFI NBN is connected and has great signal throughout the entire property. 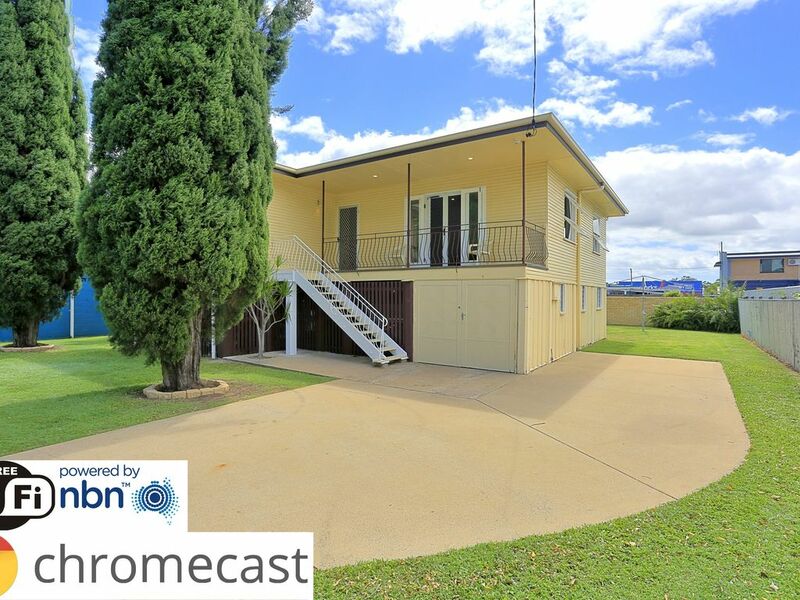 Furnished with quality lounge and dining suites along with a Panasonic 50inch TV with google Chromecast connected to allow Netflix, YouTube and more to be streamed from your own device via NBN. Panasonic 50inch TV with google Chromecast connected to allow Netflix, YouTube and more to be streamed from your own device via NBN. The pool at Oscar Motel is available for your use in accordance with Oscar Motel Pool rules. WIFI NBN is connected and has great signal throughout the entire property. Pets are welcome, however not inside the house please. The property is managed by motel managers and is professional cleaned by motel cleaners. With prior arrangement we have onsite storage for boats or caravans. My kids and I needed to stay in Bundy for 2 weeks due to surgery. The house is positioned in a great spot as it's close to the hospital as well as all the shops yet on a quiet street. Jan and Greg run the Oscar motel as well as the house and were happy to help with any requests we had. We were also allowed to use the pool which was a great hit with myself and the kids. If I ever need to stay in Bundy I would stay in this house again. My kids are already asking when we can go back to the house with the pool. Thank you Jan and Greg for your hospitality and I hope to see you both again in the future. Overall we enjoyed our stay at Oscar House. Super friendly. The house is wonderful and spacious, and clean. Beds were super comfy. Cant fault the house or owners. Next time i will book with hotel directly to save $$ as they can offer better deals when not having to pay fee to these guys. Thanks Kerri - so glad that you & your family enjoyed staying at Oscar House and we hope that you can return in the future. This house was ideal for our needs - basic clean pet friendly accommodation while my husband was in hospital (around the corner) and during his recuperation until we could resume our round Australia trip. Plenty of sparkly white towels and bed linen , new fridge- freezer, kitchen equiped with essentials (lino could do with replacing), big tv (with Chromecast), outdoor sitting/eating areas and large enclosed garden. Free wifi though intermittently weak when downloading. Near to river walks and parkland, cafes, restaurants and fast food outlets. Also town centre within walking distance. Very helpful pleasant managers and owner. Excellent value for money.